First is second radio the obturation With hydroxyde of calcium. ? It is very dense. I m notre used seeing this density with calcium s hydroxyde. Second you talk about an hour to manage to treat mv2 canal. Was the canal totally obliterated?or calcified? I m usually confronted to this Kind of situations. I begin to open the entry of thé canal with us spartan with my kaps microscope. And I try to follow the color of calcification. But often I Wonder if I have to continue with us or not? You see my question. You tell you used many k files. ?you Just used them to find patency of the canal or you altern with us? 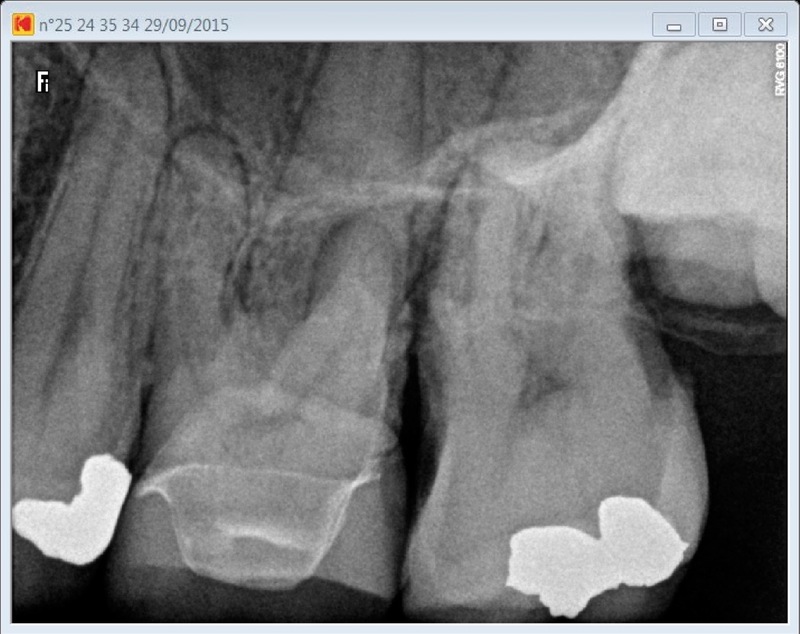 I use Metapex Calcium hydroxide with iodophorm, I think it contains a lot of Barium sulfate which is the radio opacifier responsible for this density you are seing on the post operative Xray. you gave me some important indications. can you precise me how do you do to put metapex into the root. DO you use lentulo? or some stuff like that. other thing: i guess you use warm vertical condensation.What system do you use? i’m using mac spadden technique but i would change and use WVC. I just tested some of systems, like calamus (dentsply) and sybron but my choice isn’t arrested. What could you advice me please? You do not need a paste filler to insert Metapex Calcium Hydroxide into the canal, the syringe comes with long and narrow disposable plastic tips. Sometimes those plastic tips are sealed at their extremity due to to a manufacturing issue, in that case you can cut one mm off from the tip with a number 15 surgical blade , et voilà! 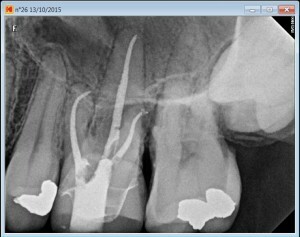 There is a twist though in order not to overfill with calcium Hydroxide, I usually extrude a little bit of the paste outside of the patient’s mouth in order to evaluate the pressure I have to exert to obtain the right amount. Then I bring the tip as close as possible to the apex and I redraw it for about 1 mm or two before applying a slight pressure. You need to apply this pressure while you are slowly redrawing the tip from the canal. Some training on used transparent endo acrylic blocs may be useful to get the feeling of it in your own hands. 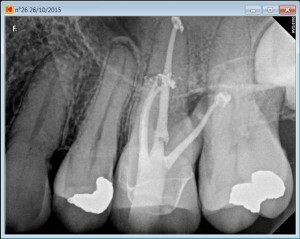 If you do extrude Calcium Hydroxide do not worry too much as it is NOT an issue as so many of us have been taught. For my backfill in WVC I have been using the Obtura System from Spartan Company for the last 20 years (roughly). I am probably still using it because I got used to it and thus I feel I have more control on my backfill, also because they probably were the first to come out with this idea and I am both grateful and faithful to them for that. Thank you again for the response. I m very attentive to détails.